TURNING OVER A NEW LEAF - JOIN ME! Chopped leaves forming a mulch for perennial beds at Butternut Gardens. Shagbark hickory is a main contributor, hence hickory nut hulls are part of the mix in this area of the farm. I live and farm in a suburban area where “lawn-scaping” is a major part of the surrounding neighborhood’s landscaping. That being said, come this time of year, the number of leaves, which falls astounds me. Other than the few that scoot into the inner confines of foundation plantings, most leaves are carted out of the neighborhood, and out of surrounding neighborhoods, to be deposited in the composting area of the town dump. There they are mixed with wood chips, grass clipping, and other ingredients, to create future mulch and compost mixtures. I grew up on 30 plus acres of beautiful property. Leaf storage was never a problem, and my family enjoyed many turns on the lawn mower naturally chopping up and mulching leaves on our lawn back into the ground. Although I yearn for a larger parcel again, here I farm on my suburban lots making the best of every inch. For a number of years, I too, having limited space for leaf storage, moved many leaves offsite. This year, I changed my ways, and I have to say, I am nearly giddy with this change. This year just about all of my leaves stayed right here for current and future use. To handle this year’s garden cleanup I implemented a four-step system using common homeowner equipment. I desperately want to share this methodology with you because I KNOW there are many others like me whose land and gardens could benefit from saving their leaves. My go-to equipment for keeping my leaves on site: weed whacker, leaf blower, and hand mower. My first step of leaf clean up was to cut down leftover plant stems with my weed eater and create two separate piles of clippings. Stems from Phlox or other plants, which had any sort of mildew or unwanted disease condition were piled for removal. These I do not wish to retain on site. Stems in “clean” condition are being kept on site to be incorporated into future compost. Using a weed eater with a metal cutting edge, rather than a string type trimmer, allowed me to easily cut thicker stems of perennials, such as Baptisia, Asters, and Peonies with one easy walk down the aisles. I may very well do a second run down the aisles with hand clippers a bit later this season to remove any stem material closer to the plant crowns. With beds cleared of plant stems, I started up the leaf blower, gently steering leaves out of the beds and onto the grass pathways between the flowerbeds and onto the lawn more generally surrounding the beds. I also corralled leaves into a large pile on my paved driveway and into a couple of piles on site. Leaf mulch on perennial bed. Step three was to bring out the hand mower. By making repeated sweeps over the leaves in between the rows and also in a couple of piles, including the pile on the driveway, I soon created a much more compact and manageable leaf situation. For step four I brought the leaf blower back to life. For a second time I walked through the grass pathways between the garden beds, and with a very, very gentle touch, I blew some of the shredded leaves back into the beds, and left some on the grass. From the larger piles of shredded leaves, I carted wheelbarrows full to layer on top of some of the garden beds. Most exciting to me, I still have some good size piles of shredded leaves, which I will combine with all of the green cuttings I have during next year’s growing season, to help build next year’s compost. To this mixture I will also add the stems from the plants that I cut in step one, once I shred them, either with my lawnmower or small chipper. So, why did I bother to do all of this? To me, leaves are like the magic of this world. It NEVER made sense to me to remove bio-product, only to add bio-product in the form of mulch carted in during the spring. Granted, my flower harvesting removes a certain amount of plant material, and thus requires some periodic amendment, but the gardens will be much closer to self-sufficient if I keep what grows here right where it belongs. 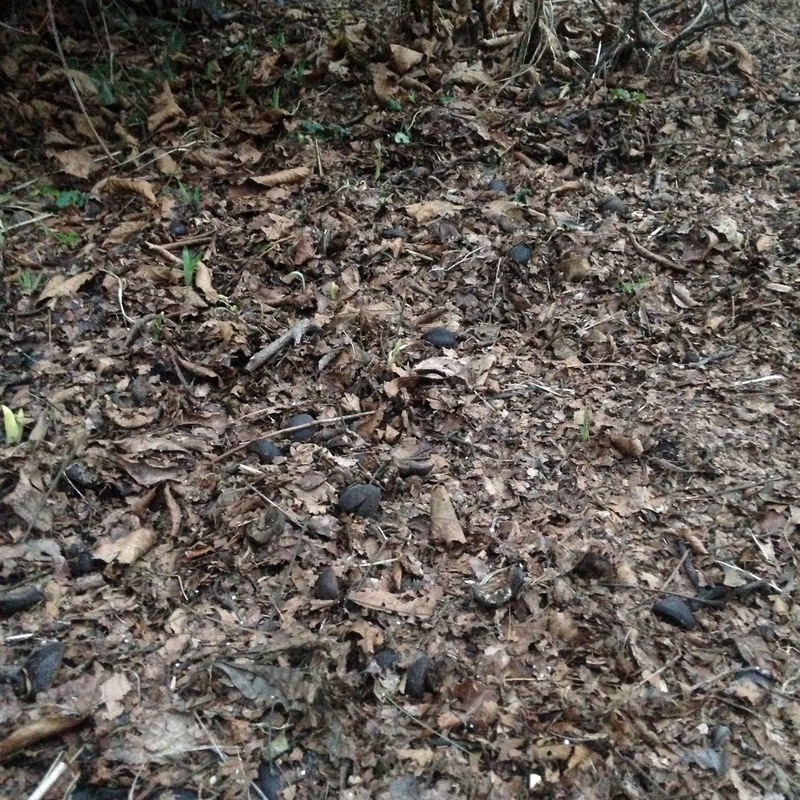 In the wooded areas of my childhood property, tree leaves fell and stayed. New trees grew and flourished with no fertilizers added. The system worked well! A leaf is a gold mine to my plants. Just think about it: a tree’s roots go a lot deeper into the soil than I could ever dig or “double dig” and all the minerals available to those roots have become available to the leaves, which are now sitting within range of the roots of Butternut Gardens’ future flowering plants. Yahoo! Another gain? Mycohrhizae. These root fungi, found in the soil, in leaf mould (partially decomposed leaves) and, hopefully, on my plants’ roots, are extremely beneficial to my plants. In undisturbed soils, these mycorhizzae send out stringy white runners for, in some cases, miles if the soil is not disturbed! This lets plants take up soil nutrients from a far greater area than they can take up in the limited areas in which their roots grow. In this plant/mycorhyzzae relationship, plants give a considerable amount of its manufactured carbohydrates to mycorhizzae as a source of energy. 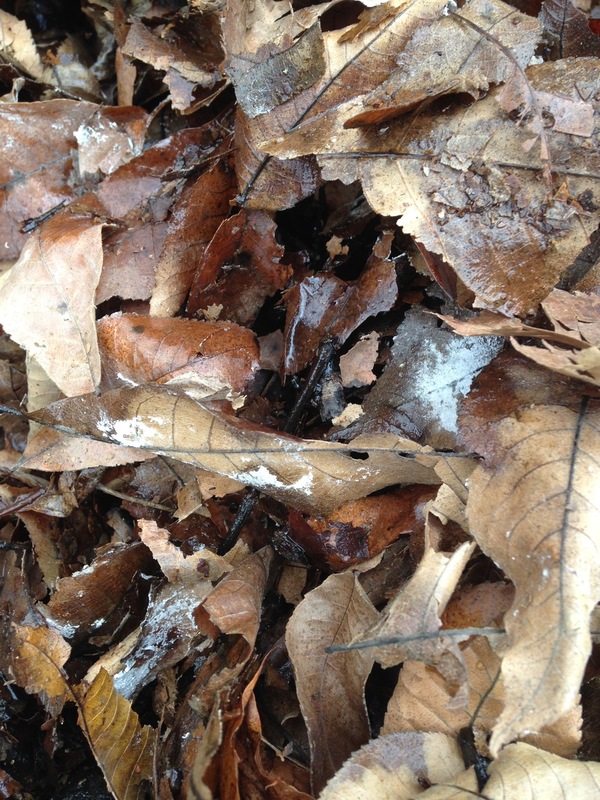 As leaves decompose, you may very well find white stringy material, which is part of the mycorhizzal system. Next year, as I noted above, I will attempt to incorporate some ofmy leftover leaves into various compost mixtures, which will find their ways to more of my annual plantings. Mulched leaves, and some which blew into my leaf mulch pile, and are not chopped up, showing fungal activity (white ares) starting to decompose the leaves. This leaf mould stage is one step in the decomposition process and is particularly beneficial to perennial plants, shrubs and trees. Over the years, I have amended my soil with products brought in from offsite, and I might still have to do this a bit, but I can’t wait to see how fertile and fluffy my leaf-amended soil will be come spring, and I feel so great about knowing exactly what is going into my soil and having absolutely no fear that the amendments might contain residues I do not want in the gardens. I hope you will consider saving your leaves next year and following my 4 easy steps for keeping leaves on site and helping your garden plants. Just remember to please wear eye protection/safety glasses, keep children, pets and other adults completely out of the way when you are using the noted machinery, and to wear ear protection. Compost, resulting from decomposition of organic material - leaves, grass, plant stems, kitchen waste, and more, is the next step for decomposing leaves, and a great soil amendment. I am saving piles of chopped up leaves for next spring and summer, so I can mix it with more green material and create valuable compost. A compost/mulched product being incorporated into a new row.